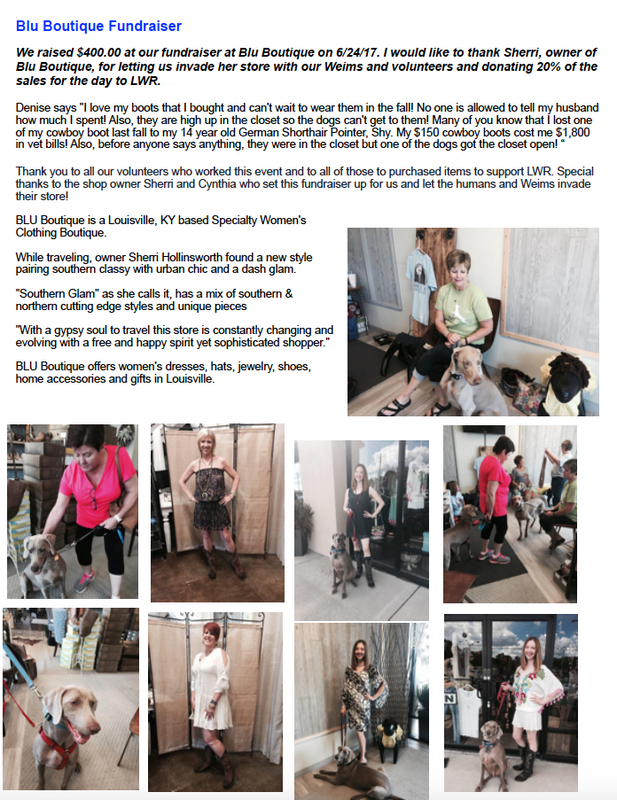 INTAKE QUESTIONNAIRE | Louisville Weimaraner Rescue Inc. Please contact your vet’s office to let them know we may be taking your Weim into rescue, and to please release information about the Weim to us if we call. Also ask them to fax your Weim's records to us at 812-256-0249 or email them to intake@louisvilleweimrescue.com. This does not prevent us taking your Weim, but helps us find the best foster/home for him/her. Is your Weim house trained? If crate trained, how long is he left and where? Is your Weim destructive when you leave? Does your Weim escape his crate or injure himself trying? Does he drool, howl or bark when you are gone? Is he on any medication for this? If your Weim guards resources, please explain circumstances. Does he/she growl at other dogs who come near his/her toys or food? Does he/she growl if someone comes between you and him/her? Does he/she growl or snap if you take food away from him/her? Dog Park? Neighbor dogs? On walks? Parent's house? etc. Describe your Weim's experiences with cats. Lives with them? Visits homes with cats? Loves them or chases them, or attacks them? Please list all pets currently in your household, and if your Weim gets along with them. Please click on the question mark to the right to add another row. If you have a mobile device, the box to add more rows may appear under the rows. This helps us determine if your Weim has lived with animals and how they got along. Does your Weim get along with them? Medium - he has a healthy interest in chasing squirrels, raccoons, chipmunks, birds etc. High – nothing is safe; he will chase cats and other creatures at any cost. Please describe the circumstances if he/she has shown animal aggression. Slow to warm up? Barks and jumps? Hates strangers? Please list everyone living in your home (including yourself), their relationship to you, and their ages. Please click on the question mark to the right to add another row. If you have a mobile device, the box to add more rows may appear under the rows. This helps us determine if your Weim has lived with many folks and their ages. Please describe the circumstances if he/she has shown any aggression toward people. Please describe the circumstances of the bite. Please describe the type of fence you have. Is it an electric fence? Does it surround a fully enclosed area? How high is it? What is it made of? Does he ever try to go over it or under it? This helps us determine if your Weims foster/forever home should have a fence. Does he ride nicely, bark, pace, get sick etc? Running, cuddling, swimming, fetch, chewing bones, etc. Explain any activities you do with him or if he just lays around all day. What time does he get up and go to bed, what time does he get fed? Do you walk him each day? Play with him? No exercise as you are not home often? Our foster homes are located throughout Kentucky, Indiana, and Ohio. We have volunteers that help transport, but we like the owner to drive the first leg, which is usually about 1 hour to the meeting place. We work with other Weim rescues in surrounding areas. If you have already contacted one of them, please let us know. We are volunteers, and the work is duplicated if more than one rescue is contacted. If you have contacted another rescue, please note which one. Please upload a picture of your Weim. Typing in your name here is your electronic signature that you are the one completing this form, that you are the owner of the Weim, and that all information herein is correct. You will be contacted within the next 24-36 hours to discuss your situation, answer any questions you may have, and talk about your Weim coming into rescue. If submit this form and get error messages, please review the form for completeness. Many fields are required and you may have missed entering some information.